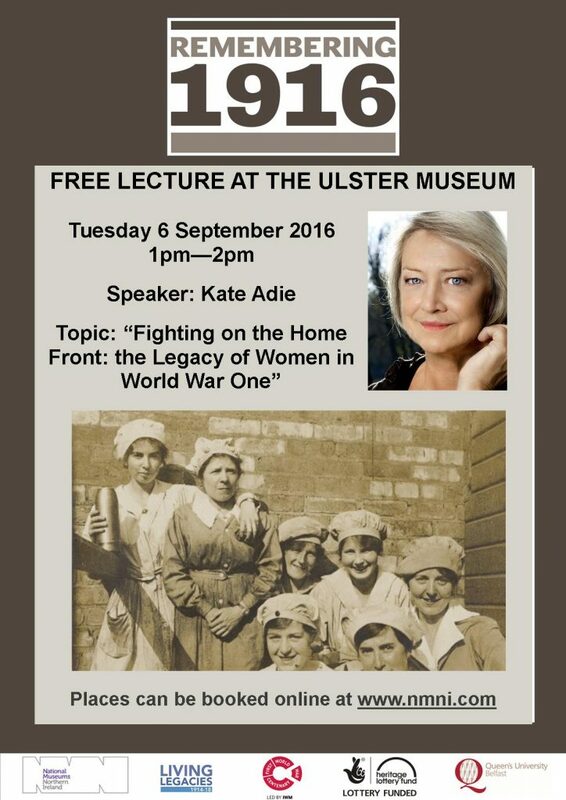 On Tuesday 6 September from 1pm-2pm the former BBC Chief News Correspondent Kate Adie will be visiting the Ulster Museum to give a FREE lecture on “Women and the Legacy of the First World War”. When the First World War broke out, and a generation of men went off to fight, women emerged from the shadows of their domestic lives. Becoming a visible force in public life, they began to take up essential roles – from transport to policing, munitions to sport, entertainment and even politics. The talk will chart the move towards equal rights with men that began a century ago and consider what these women achieved for future generations. Places can be booked online at http://nmni.com/um/What-s-on/Talks—Lectures/Lecture-by-Kate-Adie-on-Women—WW1.